This step is painting mist. I started by estimating how much paint I will have to mix of each watercolor pigment for this watercolor under painting stage of the painting and placing that amount of water in my pallet mixing areas. I then began mixing my paints and checking their strengths (tones) and color on a scrap piece of watercolor paper before touching my watercolor paper. This preparation gives me a lot more time when I actually start my painting with the watercolors. The watercolors I used for the under painting are Cobalt Blue, Alizarin Crimson and Cad Orange (Winsor and Newton) for the sky. I used the same colors with the addition of French Ultramarine a little Cobalt Turquoise and a touch of Burnt Sienna for the water. 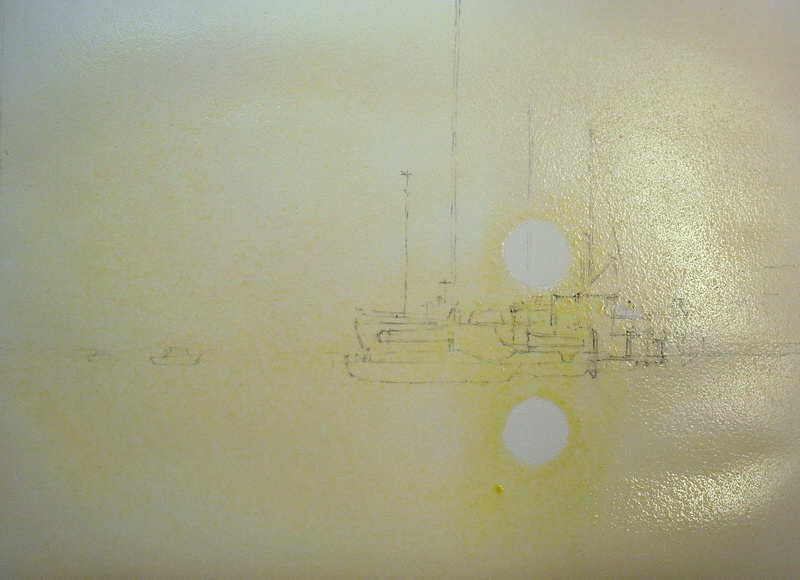 After my starting watercolor mixes are done and I am happy with them I start by wetting around the sun and its reflection with clean water (Figure: 4). To make sure all the colors do not run into one another I lower the angle of my easel to a horizontal position. I immediately start by going over the whole sheet (excluding the sun) with a tea strength mix of Cad Orange (Figure 5). For the next step I had pre mixed some Cobalt Blue with a little Alizarin Crimson for the lighter areas of the sky and some Cobalt Blue with more Alizarin Crimson for the darker areas. When mixing your sky colors remember that the sky will be the lightest part of this painting. I paint in the sky with confident strokes of my round brush roughly in the direction of the shapes in the reference photo (Figure 6). While the sky is still quite wet I paint in the water for which I used varying mixes of French Ultramarine, Alizarin Crimson and the touch of Burnt Sienna. Sometimes, when I paint this scene, I may add a touch of Cobalt Turquoise as well. Because this is a misty scene the horizon is a soft edge with no start and finish point above the water. The water watercolor mixes have to be stronger in tone that those used in the sky. I also made sure I did not lose the reflection of the light from the sun. 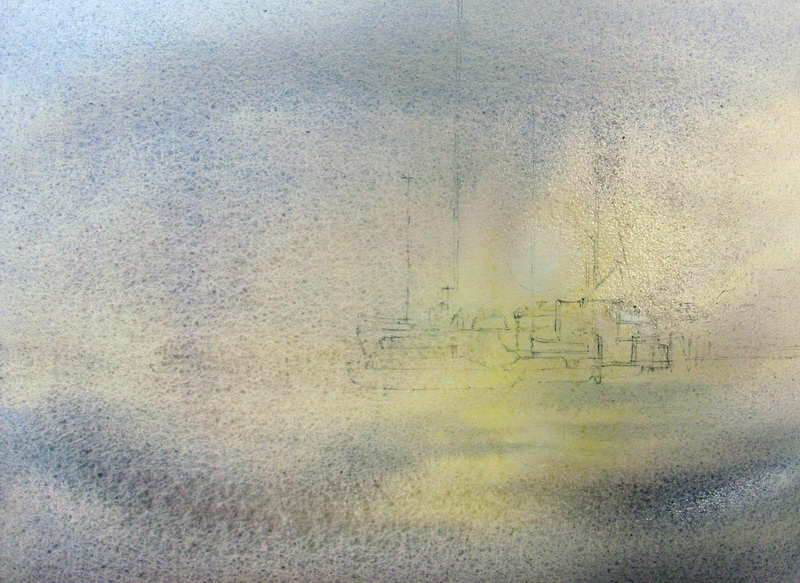 Figure 6: Drop in watercolor paint mixes for sky and sea, retain reflections of sun. I quickly add more pigment to the water mix to create darker versions of the previous water colors and then drop these into the still wet water area to create the impression of undulations on the surface of the water (Figure 7). These undulations are larger and stronger in the foreground and smaller, lighter and closer together as they move away from the viewer – don’t overdo them. The aim with these surface water shapes is to create a pleasing and believable pattern which will add a feeling of depth to your painting. Figure 7: Painting the undulations on the surface of the water with watercolors. We have now finished the painting mist part of this watercolor painting. 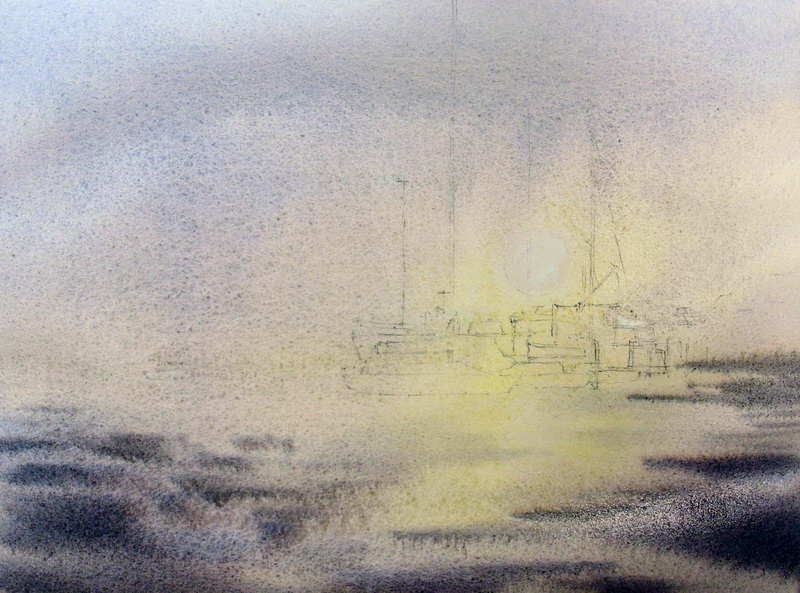 The watercolor under painting wash is now done and the sea and mist should now be established in the painting as they will not be altered any more. 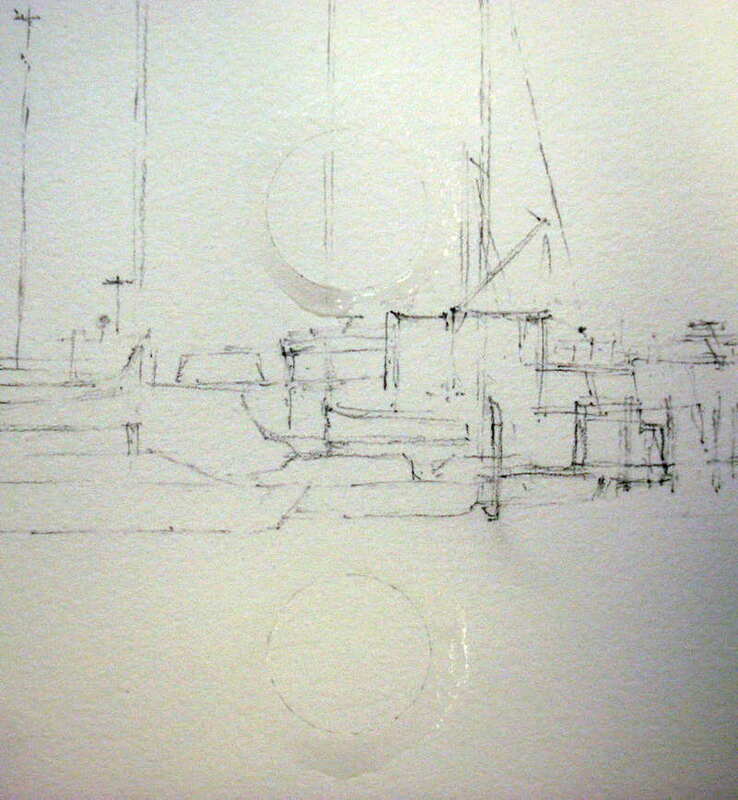 In the next step we will begin painting in the boats starting with the very soft small ones on the left side.